Hey Kitty Kitty is an online boutique that sells cool cat-themed items such as shirts, stationery, jewelry, and other accessories, as well as fun products for cats. Most of the items are made by independent artists. Not only does Hey Kitty Kitty support independent artists, but they also donate a percentage of proceeds to a different cat rescue each month. 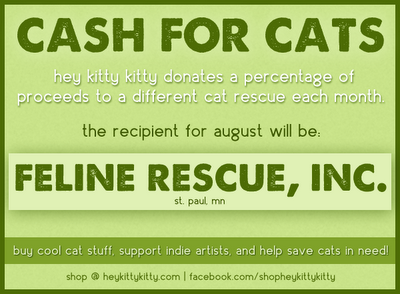 And this month's donation will be to Feline Rescue! Another good reason (if you needed one) to buy some new cat stuff. Mama Bear and Baby "Bears"